Thank you for joining us here at the house of Two Sentence Horrors. Granted, putting together very short horror stories isn't new, but a wide variety of two sentence horror stories with paintings, now that could be fun. Tales of vampires, aliens, human monsters, and, of course, zombies, to chill, thrill and delight, made even more menacing with that touch of gore, the glint of steel in the moonlight, that splash of... well, you get the idea. Please, come and sit. Make yourself comfortable. Let us make introductions. My name is N. M. Scuri. I have given my life over to writing Dark Things. You may have heard me on Ghost News Radio with +Long Island Paranormal Investigators, or read some of my stories, including "It's All Good News," and "Debbie Does the Apocalypse." 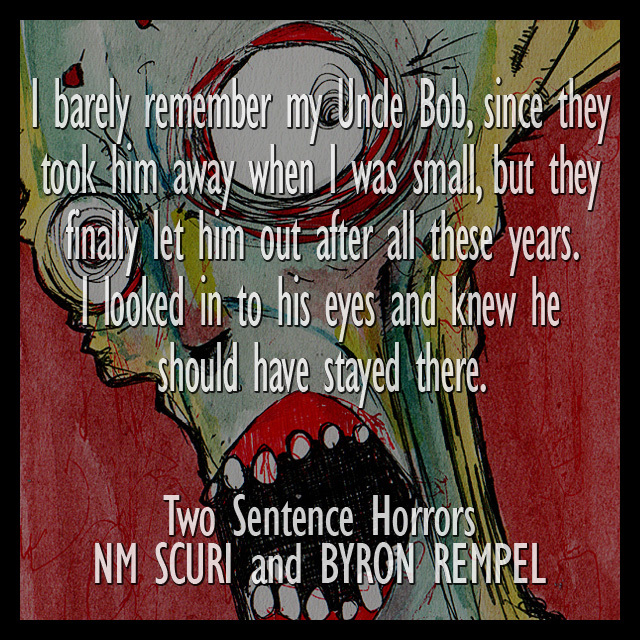 My colleague is +byron rempel. He's been drawing and painting for almost 30 years, and is the creator of the 1000 Zombie Project. More information on our projects can be found in the links section of this page. As I've mentioned, this is the home of Two Sentence Horrors, but you can find much more on our Patreon page. It's well worth the visit, I assure you.